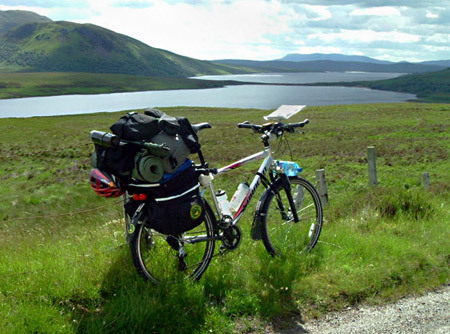 My name is Jason and I am currently in the process of planning a cycle ride from John O’Groats to Lands End, and will be carrying my camping kit on my bike and wild camping for the whole 24 days of the trip. The difference with my trip is I broke my leg last June and currently have a cage around my left lower leg; as far as I’m aware, I will be the first person wearing a frame to do this journey. I’m raising money for Help for Heroes, as a lot of the guys can be inflicted with similar injuries to what I have. Well, I completed my trip – 1,015 miles in 21 days, which was a few days faster than planned. From the first day in Scotland, I set off and was faced with high winds and rain but I was determined it would not spoil my adventure. As the days went on, the wet weather and head winds continued and the trip very much turned into an exercise in keeping my equipment dry and in working order which, when you have a frame on your lower leg, is a test of determination and organisation if nothing else! Overall the trip was an incredible experience where I learnt new ways of overcoming difficult situations and also just how deep I could dig mentally and physically when it was called for. Woodlore would like to congratulate Jason on what was surely an extremely testing journey, and for completing it in such a great time for a very worthy cause. This entry was posted in Customer Posts on August 5, 2010 by Woodlore Team. Thank you Rik. It was quite a journey. What an achievement…Such a trip with a cage around your mending leg in the wind & rain. Well done! How much money did you raise for Help for Heroes in the end? Jason is a member of our Aikido club and so we are very much aware of his levels of determination and grit. However, we were all surprised and proud of the way that he tackled this task. He is a credit to the club and we are all very much looking forward to him coming back to training later in the year once his frame comes off. We also have a close affinity to Help for Heroes and were willing him on. After his experience of, ‘wet and dry kit’ he is now going to be very well prepared for the next Aiki Woodlands Course! Well done Jason. Well done Jason. For yourself and a worthy cause.